Hungary is a good place to take stock of the current state of material culture studies. Because Hungary is simply a good emblem of `anywhere,’ in that it represents neither a vanguard nor a backwater, but works as simply another ordinary place. That is significant to me because the material culture studies that I guess I have always wanted to promote are precisely about this same ordinary whether as blue jeans, or domestic interiors. Edited by Anu Kannike and Patrick Laviolette, 2013, Estonia: University of Tartu Press. Distributed Objects: Meaning and Mattering after Alfred Gell. The Noodle Narratives: A worthy successor to Sidney Mintz? In a recent interview on BBC Radio 4’s Thinking Aloud (www.bbc.co.uk/programmes/b03bfk9h), the book the Noodle Narratives was compared to Sidney Mintz’s classic study Sweetness and Power (sidneymintz.net/sugar.php). In Sweetness and Power, Mintz famously shows how sugar underwrote and structured the capitalism of slave labour and factory labour in the British Empire, and convergently set out what class meant in the British Empire in consumption. Is this comparison justified? 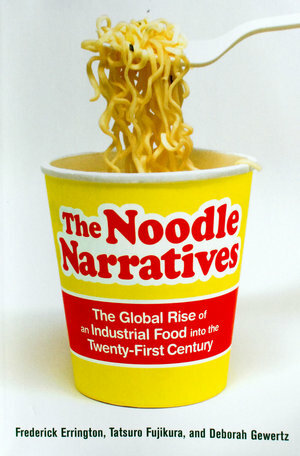 Are noodles the capitalist staple infusing our contemporary world system? After knowing about the book for a couple of years, I finally found the time to read The Hare with Amber Eyes (2010), Edmund de Waal’s evocative exploration of his material patrimoine. The book traces its author’s geographical, archival, and emotional wanderings though the past century and a half and across the globe as he pieces together the story of his family, largely through its accumulated—and then mostly alienated—collections. Where objects are no longer extant, de Waal reconstructs their once-presence from lists, ledgers, account books, registries, catalogues, photographs, letters, memoirs, and novels. Benediktsson, Karl & Katrín A. Lund (eds). 2010. Conversations with Landscape. Farnham: Ashgate. Finally a book that could speak to me. And yet, with the unpredictability of conversational direction that the editors remind us of in their introduction, what would I hear? How to respond? Such ideas were made even more daunting when flipping through the table of contents to realise that we are dealing with a cacophony of no less than eighteen different authorial voices, not to mention those of informants, reference citations and of course the unique narrative style of the volume itself. Control Order House is the latest project of the artist, photographer and archivist Edmund Clark. Clark’s first project, Guantanamo: If the Light Goes Out, explored the domestic architecture and environment of the Guantanamo Bay Military Base and tracked this “domesticity” back into the homes of British detainees, particularly following the case of Omar Deghayes who was imprisoned in GTMO from 2002-2007 when he was released without charges. This photographic project explores three ideas of home: the idea that GTMO is home to an American community of military personnel and their families, that it is home to prisoners arrested as terrorists, and the homes where former detainees are now trying to rebuild their lives. “Control Order House continues my exploration of the use and representation of control and incarceration in the ‘War on Terror’.